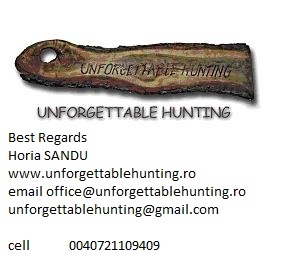 3 hunting days / 4 nights in Romania / Vrancea area. Finest Romanian meals, license, firearm permit, all transportations in Romania, first preparations of the trophy(European style). shooting fee for an injured and non recovered piece - 300 EURO/animal. 426 registered members (1911a1, 1bigdude, 19352012, 257heaven, 222ND, 2500HD, 57 invisible), 1,045 guests, and 651 spiders.